Product prices and availability are accurate as of 2019-04-21 22:11:13 UTC and are subject to change. Any price and availability information displayed on http://www.amazon.com/ at the time of purchase will apply to the purchase of this product. Only Compatible with RED Color Lotos LTP5000D, LTPDC2000D, BLUE Color LTP6000. NOT Compatible with BROWN Color Lotos LTP5000D, LTPDC2000D. 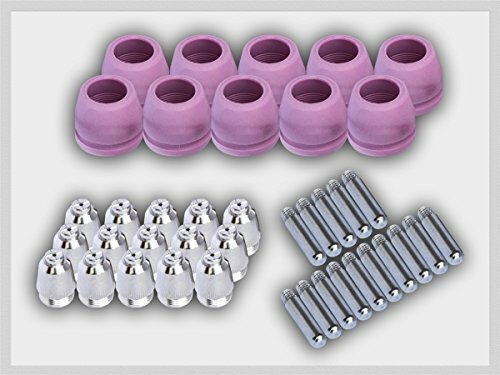 This set of consumables may not be used for other plasma cutter models and/or brands. Lotos plasma cutters should use only Lotos Technology factory manufactured genuine consumables. 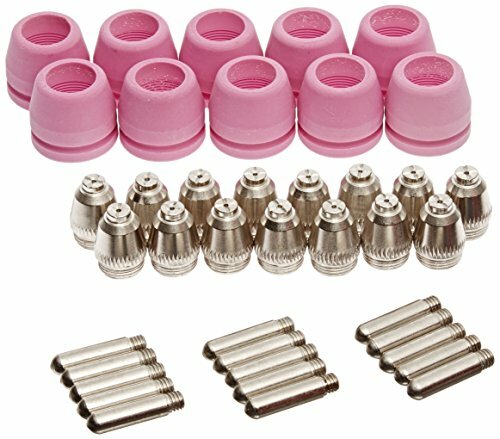 Includes: 15 Nozzles 15 Electrodes 10 Cups These consumables are only for: Lotos LTP5000, Lotos LTP5000D, Lotos LT6000, Lotos LTP6000, Lotos LTPDC2000, Lotos LTPDC2000D, Lotos LTPAC2500 It does not fit any other Brand and any other Model of plasma cutters Nozzles and electrodes are made by genuine 100% copper instead of cheap plated copper alloy The length of nozzle is 0.5" and the length of electrode is 1.3"